Special 2007 Promotion! Regular $1,595 New Year 2007 PROMO... $1,199 & FREE Shipping!!! Foosball gets a new attitude! Amazing Harley-Davidson® Foosball Table will provide countless hours of fun and excitement for all skill levels. Custom graphics combine vibrant Harley® flames with the subtle look of leather and the distinctive look of diamond-plate. Heavy duty cabinet and play surface construction with a die sublimation processed melamine graphics provides lasting durability and will not show normal play wear. Surfaces wipe clean with a damp cloth for easy maintenance. Orange and black professional style weighted and balanced players with a custom foot design allow for tournament style ball control. Play field has full length hardwood supports to guarantee continued level play and all shot contact non-wood pieces are high impact styrene. Made in the U.S.A.
Carrom continues to strive to make available the most popular line of family-oriented games. As always, their motto and production goal remains "Quality Games for the Entire Family." Carrom Company is now over 100 years old. Custom graphics combine vibrant Harley flames with the subtle look of leather and the distinctive look of diamond-plate make this Harley-Davidson collectible completely unique. 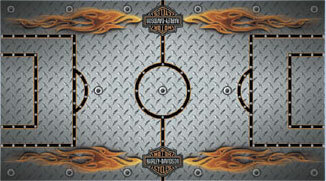 The Harley-Davidson Collectible Foosball Table’s heavy duty cabinet and play surface construction with die sublimation processed melamine graphics provides lasting durability and will not show normal play wear. Surfaces of the foosball table wipe clean with a damp cloth for easy maintenance. Only the Harley-Davidson Collectible Foosball Table offers orange and black professional style weighted and balanced players with custom foot design allowing for tournament style ball control. The playfield of this Harley-Davidson collectible has full length hardwood supports to guarantee continued level play and all shot contact non-wood pieces are high impact styrene. Just like Harley-Davidson motorcycles, the Harley-Davidson Collectible Foosball Table is made in the U.S.A. Check out the Harley-Davidson Collectible Foosball Table now.